Built of brick circa 1855 by architect and inventor Warren P. Miller, this Gothic Revival home was purchased by the Aaron family in the 1870s. It remained in the family until 1955. At that time, the only son of Mary Bobo Aaron gifted it to the City of Marysville to be maintained as a museum in honor of his mother. Mary Bobo Aaron on her wedding dayThe Mary Aaron Museum was added to the National Register of Historic Places in 1998 as the Warren P. Miller house. 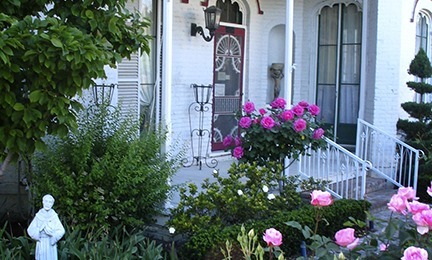 The Mary Aaron Museum is located on the corner of 7th and D Streets in downtown Marysville, California. Parking is free on the streets surrounding the museum. Guided tours of the museum are free, but donations are gladly accepted. Fridays and Saturdays1 p.m. – 4 p.m.
Other times available by appointment; contact us to schedule your group today. Copyright 2019 ©Mary Aaron Museum; Marysville, CA. All Rights Reserved.